•This wine bottle cooler was handcrafted in Germany by Zoeller & Born. 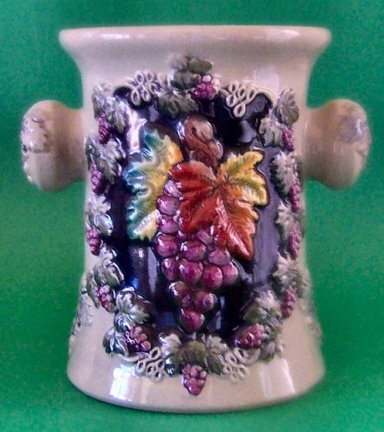 •This colorful stoneware piece features a handpainted relief of a bunch of grapes. •This heavy piece is about 7 inches tall. •Zoeller and Born is a family owned operation that has been producing high quality beer steins since 1956. They specialize in steins with stunning handpainted relief. Zoeller and Born is one of only a few remaining German stein companies that still produce their steins in Germany with 100% German materials and German labor.